If you’re an advanced vaper, you’ve surely run into a flooded e-cig tank or atomizer. Unfortunately, this is a common occurrence for many users of drip atomizers or tanks, especially when they’re first getting used to the dripping method - a much more complex way to vape, commonly used to produce big, flavorful lung hits. While a flooded tank seems like a devastating blow to your atomizer or tanks, have no fear, this mess is easily cleaned. Below we’ve outlined all the steps to fix a gurgling, flooded tank, along with various reasons flooding happens, to take better precaution moving forward. In cartomizers, atomizers and tanks, coil and base o-rings seal the components and provide an airtight tank for vapor to pass through. Occasionally, o-rings can break or get too loose, causing tanks to flood. This can happen when o-rings are compressed too tightly or jolted loose from contact. If you’re pulling normally and getting less vapor than expected, don’t hit the vape harder. Instead, make sure your tank isn’t flooded. Wicks from the coil absorb eLiquid from the e-cig’s tank and when users hit the device too hard, their suction creates a vacuum that can pull more eLiquid than needed and in turn, flood the tank. When filling your tank or atomizer, the key thing to avoid is getting eliquid into the center air passage of the tank. When users’ take a draw, air flows through that passage and if the air passage is filled with eLiquid, users will end up with a mouth full of eLiquid. 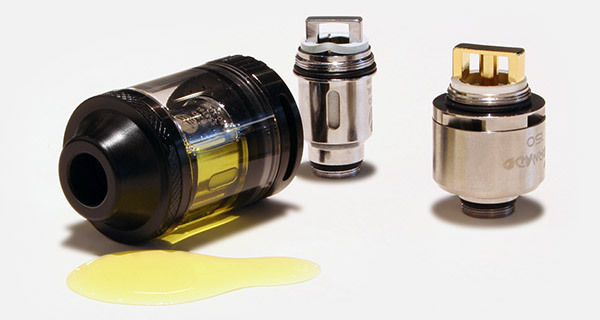 For most bottom coil atomizers, tanks and cartomizers, overfilling isn’t a huge problem. However, many top coil tanks with long wicks can easily become oversaturated. When that happens, juice can easily spill into the passage and flood the tank. Since warm temperatures thin out eLiquids and cool temperatures make them thicker, flooding can occur when your eLiquid has become too thin and cannot stick to the wick. To avoid flooding, make sure to keep your liquid stored in rooms with consistent, evenly-distributed temperatures. Even with a clear understanding of why tanks get flooded, the fact is, they still get flooded. If your tank or atomizer accidently gets filled with eLiquid, the following steps outline exactly how to clean a flooded e-cig tank. Uninstall your tank from your device. Wrap the base of the tank in a paper towel to avoid any messes. Blow any excess eLiquid through the mouthpiece and out of the airholes into the paper towel. Finally, thoroughly clean the tank with a Q-Tip until dry. Align wick with the tip on the tank or the tank cartridge, depending on your model. Make sure wick is damp, not soaking wet. Place a single drop of eLiquid on the cotton to prime the system. Raise your wattage or temperature setting. In some cases, atomizers require a high wattage setting in order for the e-liquid to be fully vaporized. If there is a high volume of cotton that is constantly wicking e-liquid, you need to be sure that all of the e-liquid is being vaporized from the cotton. If the atomizer becomes over-saturated, you will experience flooding and leaks. Try to fire the atomizer 1-2 seconds before taking a draw. Now that you’ve got a good understanding of tanks and how they operate, browse MyVaporStore’s full selection of Cartomizers and Tanks, along with our full line of Accessories for o-ring kits and more.